In this article we have identified 6 popular anaerobic digestion and biogas plant products, which with the rising rate of biogas plant installation, has meant that these products are in high demand to ensure the proper running of an ever increasing number of anaerobic digestion plants. It is important to measure pH and Redox potential is all anaerobic digestion plant fermenters, other than perhaps some of the most basic un-mixed plastic membrane covered anaerobic digestion lagoons which are used in hot countries, and are not optimized or controlled. For all other plants this measurement is essential, and also needs to be reliable, and very accurate even if not re-calibrated over long periods. That's because the pH and redox information the device provides is used to adjust the operation of the fermenter. Get that wrong and the production of biogas can cease! Keeping a biogas plant running at close to its full design gas yield, is done mostly through adjusting the feed material type and quantity day by day, and also at times, to decide on how much of any dosing chemicals must be supplied to bring the pH or Redox back within the optimum operating range. These adjustments are used to ensure that the micro-organisms in the digester are maintained in the chemical conditions in which they will thrive and produce the most biogas, at a high methane quality. One company that has a pH/Redox monitoring instrument which is in high demand, and is designed for the extreme conditions found in biogas plant reactors is Hach Lange. “The digital pHD electrode used to measure pH and redox is fully encapsulated so that it does not come into contact with the fluid being measured. A special, soil resistant salt bridge forms the direct contact to the fluid to enable the measurements to be made." pH test strips have been around for many years, but nowadays the technology behind the best of these strips enables the user to assess the pH value, and not just whether the liquid tested is acid or alkaline. They are still not as accurate as using a good quality pH probe, however, they can be very useful when an immediate assessment of approximate pH value is needed, and when there is no probe, such as the Hach Lange pH/Redox probe discussed in 1., above. For that reason we have included pH Test Strips in this list of our "in demand" anaerobic digestion products. Probably the best known test strips are those made by Merck in their Millipore range. They offer a large number of products for pH measurements with various methods of operation. These include pH indicator papers, and MColorpHast™ pH test strips, and pH indicator solution, however it is the simple test strips that are most used and can be an essential tool, especially when carrying out process troubleshooting site checks on anaerobic digestion plants. NPL, once the UK's National Physical Laboratory is a private company which specialises in carrying out trace-level impurity analyses for gases, especially for biogas. Knowing what may be present in biogas as trace-level impurities is critical for the design of the gas-engine for power generation, and also increasingly for upgrading biogas to biomethane by removing these impurities. The concentrations of both the trace-level impurities which cause corrosion and those that cause the build-up of hard silica materials on valves, and combustion cylinders, are assessed by using these tests. Also, very sticky tar-like substances within a gas-engine used for electrical power generation, can build-up, and trace-level gas impurity tests will when used skilfully by an expert, allow the need for pre-treatment of the biogas before it enters gas engines to be investigated, thus avoiding the risk of very expensive remedial maintenance on the power generation and biomethane upgrading system later. Almost all anaerobic digestion systems require the monitoring of flow, and it is particularly important to measure the flow and volume of the substrate feed continuously and accurately, so that the calorific value feed that is added is known, and can be controlled. The Prosonic Flow B 200 by Endress and Hauser Ltd is a well-known example of such a flowmeter. An inexperienced biogas plant designer might think that a cheaper, vane type flowmeter would be satisfactory, but due to the presence of fibrous materials in the flow, these get caught around the vane of a cheap flowmeter and cause malfunction of the device. As a "non-intrusive" flowmeter the ultrasonic types are very well suited to biogas applications, and ATEX rated explosion proof versions are also available to avoid explosion risks where these occur. Biogas plant mixing systems have traditionally been under-specified for completely stirred mixed reactor type biogas plants. With inadequate stirring, their performance can be far below what would be achieved if well designed, good quality mixing, was installed and operated. Anaerobic digestion operators can experience problems with the build-up of a hard cap of biomass floating on the surface. It can impede the circulation of biogas through this "hard crust", and as the crust can contain a large proportion of the organic material in the reactor, the rate of biogas production can be significantly reduced. The installed mixers may be incapable of breaking up the "hard crust" and opening the top of a reactor to physically smash up a floating crust, means significant plant down-time, and loss of biogas production. The Landia GasMix has not been around for even 18 months (time of writing is May 2015), and yet it is a biogas plant reactor mixing system that is in high-demand. Users report that once installed, and using the cleverly designed combination of biogas and substrate purging, hard crust accumulations can be broken up and re-submerged in not much more than half an hour of operation using this system. Once initial crust break-up and re-suspension has been achieved, the system is run on an automatic setting and runs for only short periods daily, to prevent any further significant build-up of floating material. If there is one thing that all biogas plants have in common is that they produce gas which must be stored, until needed. Suppliers of biogas storage covers and vessels, have been in increasing demand for their products, as the rate of anaerobic digestion plant construction has accelerated. VERGAS Ltd is a leading company in biogas storage systems, and specialises in the design, manufacture and installation of high quality flexible membrane biogas management equipment, worldwide. We hope that this article has been useful. If it has, or even if it has not and you have suggestions on improvement you would like us to make, please provide us with feedback via the "commenting" facility below, or via our contact page. "Waste Fed Biogas Plants" Should Now as Time Goes On, be Able to Throw Off the Critics Who Confuse them with Food Crop Based "Biofuel Biogas Plants"
The EU has at last agreed 7% cap on 'harmful' biofuels, and although many would say that this cap should have been set much lower, it is an important step away from one aspect of the use of anaerobic digestion, which has caused much damage, to the concept of gaining renewable energy from biogas plants, in the eyes of the public. About 15 years ago, when oil price rises had been inexorably rising for as long as anyone could remember, and the supply sources of oil looked increasingly insecure, governments began the renaissance of anaerobic digestion by subsidizing so called "biofuel" biogas plants. The idea of biofuel is focused mainly on the production of diesel fuel, and the organic feedstock was almost entirely food crops. It was seen as being "green", at first, but when in-depth and "whole-life" assessments were conducted on the balance of net energy produced by the crop use processes, and the fact that food prices have been rising as population demand raises consumption, the idea quickly began to look like nothing other than "greenwash". The big hope that gave rise to the whole "biofuels" movement, was that the carbon emissions reduction benefits from it would be large, and would justify the use of food to make energy. But, sadly these gains have never materialised. Worse still, in countries like the UK where biofuel subsidies were introduced late, and were lower than in Europe generally, waste material fed anaerobic digestion plants have often been mistakenly also tarred by the same brush, and perceived cynically as just another deceptive "green" lable. Even today, objectors protest about proposed organic-waste-fed biogas plants, in the false belief that they will turn-out to be just the opposite! This is entirely due to studies conducted on biofuel production, and planning consents are being held-up, and even rejected, due to negative publicity related in fact to crop-fed biofuel plants, by hostile media and the public. On this blog we have always been at pains to make the distinction between the very positive environmental (carbon emission reduction potential) of waste fed biogas production, as opposed to the poor record of crop-fed biogas production when used to make biofuels (mostly bio-diesel). The main countries which did adopt biofuel production in a big way were, Germany and other central Eurpoean States, the US, and some South American countries. Most of these have been progressively reducing their subsidies for biofuels for some time. In fact, steep subsidy reductions in Germany have led close to stagnation, in the numbers of their biogas plants in recent years. The 7% cap on 'harmful' biofuels will go hand-in-hand with further reduction in biofuel production subsidies, as governments seek to cut-back their national biofuel production, and to meet the new low target. Hopefully, existing Agricultural Biogas Plants built for the creation of biogas for further processing into biofuel will, in the most part, be able to convert their operations to accept agricultural waste and continue in profitable operation as a result. After more than 10 years of debate, the European Parliament has today (28 April) agreed new laws to limit the use of crop-based biofuels across the continent. The new rules effectively limit the use of biofuels in the transport sector at 7%, which count towards the 10% renewable energy target in transport by 2020. The decision will prevent up to 320 million tonnes of CO2 - equal to Poland's total carbon emissions in 2012 - from entering the atmosphere. It has dually been welcomed by green groups and industry bodies alike. 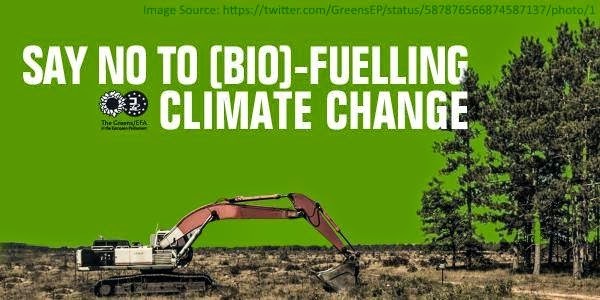 Friends of the Earth Europe's biofuels campaigner Robbie Blake said: "Let no-one be in doubt, the biofuels bubble has burst. Pietro Caloprisco, senior policy officer at Transport & Environment, said: "After years of industry and member state lobbying, this agreement is far weaker than the Commission's original proposal. 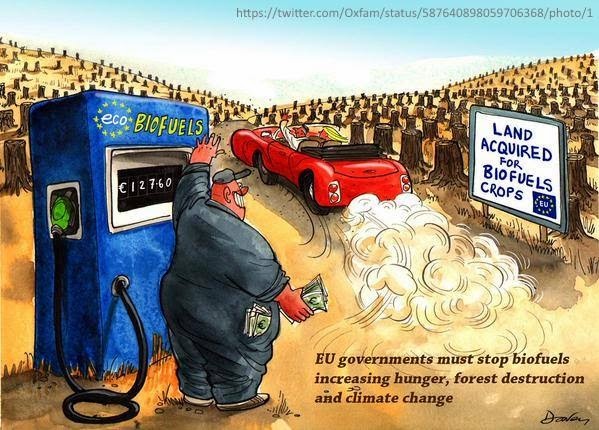 Nevertheless, it sends a clear signal that land-based biofuels have no future role to play in Europe." European representatives of the Green party were rather more scathing, calling the deal a "major missed opportunity". Green climate spokesperson Bas Eickhout said: "Feeding crops into cars has fuelled rising food prices and rainforest destruction and the EU should not be further exacerbating these trends by promoting the use of agricultural land for fuel. "We should be shunning the use of food crops for fuel altogether but a 7% 'cap' is clearly too high and will allow for further increasing the large share of climate-damaging biofuels in our fuel mix."